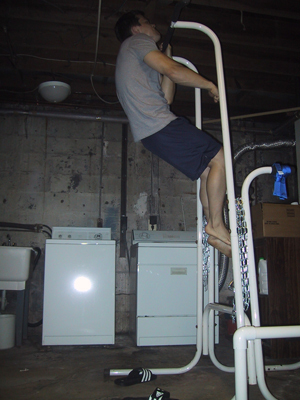 Part of what I tried today was an OAC (one arm chin up) hold. I used to work this hold pretty regularly and got to the point where I could hold it with my right hand for 15-20 seconds. Well I don’t work it routinely now and I am probably tipping the scales 5-7 pounds heavier nowadays. I was only able to hold it with my right hand for a second or two, it was pretty pathetic. The only mitigating factor is I tried the hold at the end of my workout after fatiguing my upper body pretty thoroughly. Still, I need to do better with this type of hold as it is indicative of your overall pulling power, endurance and strength.